Combining modernised comfort with details from the original 'Old Skool' design, the Vans 'Anaheim Old Skool 36 Dx' trainers pay tribute to the brand's first factory in California. Crafted with a suede and canvas upper, the low top sneakers feature a reinforced toe, a cotton lace fastening and UltraCush sockliners for added comfort. The brand's iconic rubber waffle outsole provides ultimate grip. 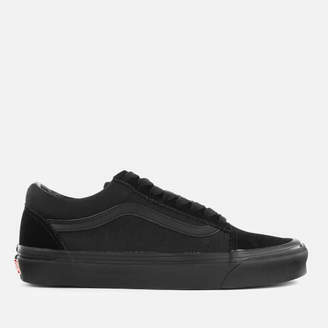 Complete with tonal sidestripe detail and an 'Off the Wall' licence plate to the heel. Upper: Suede/Canvas. Sole: Rubber.